Discussion in 'Dovetail Live Article Discussion' started by TrainSim-James, May 18, 2018. 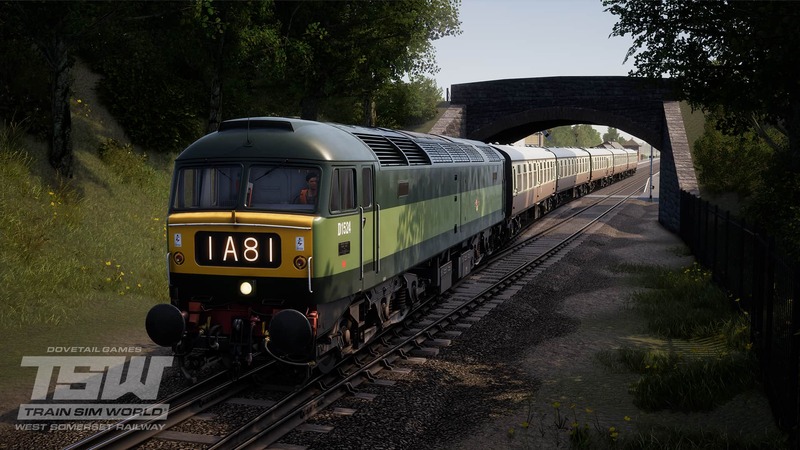 Train Sim World: West Somerset Railway is coming soon, and with it, the classic BR Class 47 locomotive! The locomotive looks very good but now we are having locos and stock there is more of a need for custom consists and an editor to define and perform bespoke operations, as well as other locos to bolster the WSR fleet or diesel gala. On release will there be a way of driving the Class 47 on the GWE route? It seems a shame to have a Type 4 just pottering up and down a preserved line at 25mph. D1778 and D1500. D1500 is located at the Midland Railway and D1778 is at the Watercress line. Are you (DTG) adding all the preserved Class 47s to make the idea of a diesel gala more realistic by having more than one of each loco. D1524 in the first picture at top of this thread is at Embsay & Bolton Abbey railway; correct livery and number though. Is there a plan to add more realistic liveries for the other Class 47s at a later date? D1107 in this image. Should be Rail Express Systems Livery with TOPS number 47 524. The class 47s looks good aswell, but the cab looks amazing to me. Noticed the same problem with the Class 09s. 'D6667'; Completely fictional. As can be seen at this list of Class 09s, http://www.brdatabase.info/locoqry.php?action=class&id=9&type=D&page=alloc, no such loco has ever existed. NorthRail1 Yep the 47s are other preserved ones, just not in their real liveries. The 09s confuse me too because of their fictional numbers. We had a discussion on discord about it when the articles came out. These would be the correct numbers for the 09s: D3665–D3671, D3719–D3721 and D4099–D4114. Given that this is a preserved line, is there going to be any traffic on the line? The amount of on-line traffic peaked with the GWR line, it really feel realistic. The German line is beautiful, but the traffic so sparse that it hardly looks credible. Most of the WSR is single track, so traffic would be limited to the double track sections which are mostly at stations, if they do include traffic I just hope the AI signalman is up to the job of controlling it. Personally, I would prefer that DTG delay release of this DLC for the time needed to add freight wagons, locos to serve them, and scenarios or sessions for same, rather than sticking to the weak premise of "Diesel Day" -- unless, that is, they already have this in mind. After all, let's recall that NEC first appeared without freight sessions. Whilst it would be good to see some freight action on the West Somerset Railway, as it is primarily a passenger route I think that DTG won't be adding any freight wagons at the initial release though may add them later in a further dlc with new locos. The GWE Service Mode Timetable currently does not support loco-hauled passenger trains but we're looking into it and may feature a revised timetable a little later down the line. We're also looking at other ways we can bring the Class 47 to the Great Western Main Line. Once we've worked this out and we're sure it works, we'll let you know. Many of the 'Preserved' Class 47s will feature in the West Somerset Railway, though they will all be in the Two-Tone Green livery. We may look to do some of the other liveries at a later date. Which is your favourite that you would like us to look at first? I've passed the odd 09 numbers over to the Development Team to look into. The numbers should all be valid and appropriate to their Class, and same as the 47 mentioned above, the liveries on the 09 will all be BR Green. There will be traffic on the line as per the Diesel Gala Timetable but, as the line is single-line working with passing loops, you'll only see passing trains at the loops - and you may get held up along the way as you wait for occupied sections to clear. Thanks for the response TrainSim-Steve . Personally I would prefer BR Rail Blue to be added to both the Class 47 and 09 first as that is probably the most common preserved livery over than BR Green for those locos. So if I buy the WSR I won't be able to drive the traction and rolling stock on any other route. When you decide how to implement the Class 47 into the GWE timetable, will I need to buy another DLC with the Class 47 for the GWE route? I miss the good old days of MSTS, Trainz and Railworks, where I could buy a locomotive I liked and then drive it on any route I liked. I guess these days that's considered far too sensible to be included at the innovative cutting edge of Train Simulation. Is the development team targeting most of their time bringing new content to TSW for pc or is there a team of people working on content for Xbox version? Seems to me everyone's working on TSW and not doing much for Xbox? At this time, we're trying to work out the best way to make the Class 47 work on the Great Western Main Line, it is highly unlikely this will require any additional purchases if you already own both the West Somerset Railway and Great Western Express packs. It's worth bearing in mind that all of the other titles you mentioned are, and have always been, feature complete. Meaning they were practically complete from a code base perspective. Train Sim World is still growing and developing the same features that you enjoyed in the other titles. All those features you know and love will make their way to Train Sim World. Any info on how near we are to getting some form of editor and/or development tools so we can create our own scenarios, routes etc? Why is TSW not in Early Access if fairly basic features are intended to be included but currently not? You say TSW isn't 'feature complete' but that to me sounds like a weird way of saying it's an unfinished product. It's frustrating, because on the one hand the WSR looks beautiful, I love the choice of traction and I can't wait to drive it, but on the other hand basic features like Quick Drive and the scenario editor don't seem to be anywhere on the horizon, despite claims to the contrary. I don't want to get burnt like the FSW chaps did, where they bought a load of DLC assuming they were buying into the future of the simulation, only to have it cancelled a short while later. Could we please have an up-to-date official list, in one place, with all the features that DTG intend to implement into TSW? I have to keep looking at old Facebook posts, forum posts and Steam Community posts to find out which features are eventually intended to be added. Thanks. A question: will WSR locomotives roll out with new "improved" traction physics model that has been talked about in that one article? On the features side of things, that's a really great suggestion and I'll see what I can get together. Thank you for taking the time to reply to my comments, I really do appreciate it. I don't think DTG has a license for West Coast Railways so this might not be possible. Wouldn't they need to remodel the front of the 47 to remove the headcode and change the light arrangement, as well? Well, it's not just me who wants to see this fixed. And truth be told, I'm probably not the person who should judge how accurate it is. I think I've seen some comments from actual train drivers earlier, so if they're still with the game, you should ask them instead. Although, obviously I would notice if the most noticeable issue is gone. Looks decent as per usual, i will always purchase any UK based content and even though this isnt my cup of tea i will purchase to see how the countryside looks in the game with the lakes etc. I just hope either GWE gets an extension or a long uk route is coming our way as that is what i play train sims for. I cant play ts2018 anymore as the graphics look awful compares to TSW so i do hope there is a long future ahead and a variety of long/short runs on future routes.